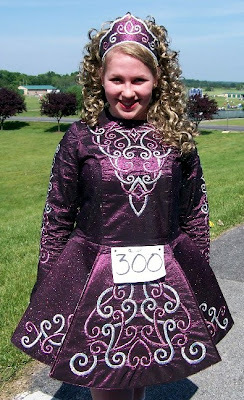 When oldest diva Molly hit the novice level in Irish dance, I decided to try my hand at making an ID solo dress. Her teachers did not really encourage solo dresses at that level, but her school dress was getting too small and we were all interested to see what I might do. 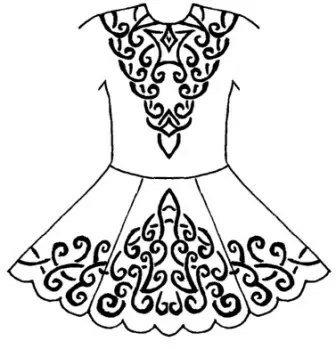 I figured it would be a challenge, but I had been sewing since I was a child, had training and experience making clothes and theatre/dance costumes, and I had been altering the dresses for our ID school for a couple of years…I felt up to the challenge. 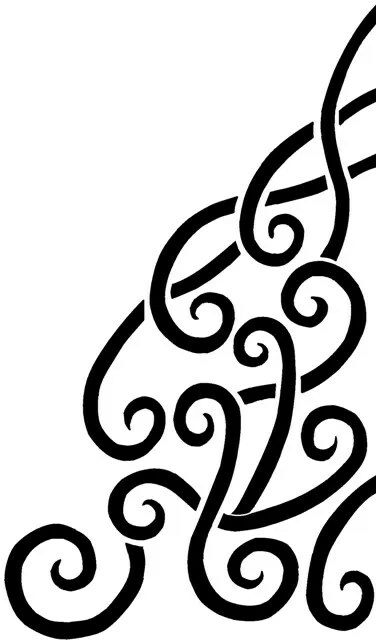 As most ID dressmakers know, no matter your prior experience, the learning curve is actually a vertical climb, especially when it comes to putting the design on the dress. In this area, I was a babe in the woods…in a vast desert…on an iceberg in the middle of a never-ending ocean!!! But I persevered, mainly because I was so ignorant of what I was about to take on! …to this so the lines were even. Have to say that I felt strange “changing” another artist’s design. I hoped I was not messing it up! I used Paint in a very laborious fashion. Ugh. Now I know I do not have to do that. Knowing what I know now, I am amazed. Now on to what I do now. Susan (Gowin, my Feisdress partner) does all the designs I work with now. She gives me the designs in the correct size, placed correctly on the pattern, in either an EMF or JPEG file. Sometimes the file is in color, sometimes black and white. 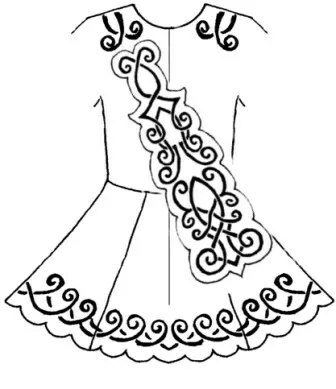 This is the bodice design for the flower solo as sent to me by Susan. All embroidery lines are to scale, tho’ sometimes we fuss after the fact. I then digitize. 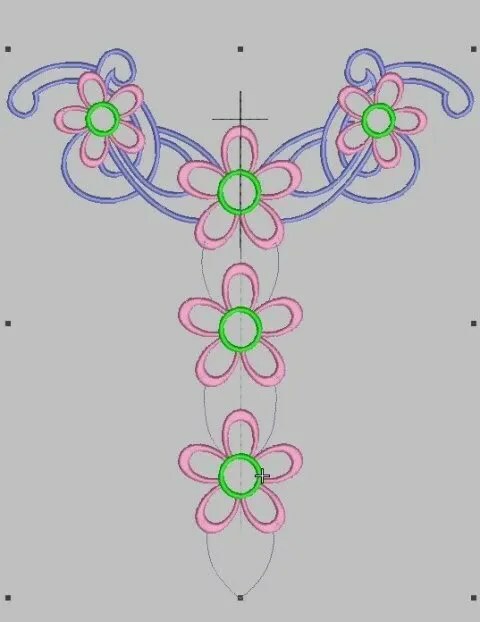 Even though the embroidery software can digitize embroidery and applique automatically, I do not use those functions because I do not like what happens. Strange computer logic that irritates me. I do it all “by hand,” so to speak. 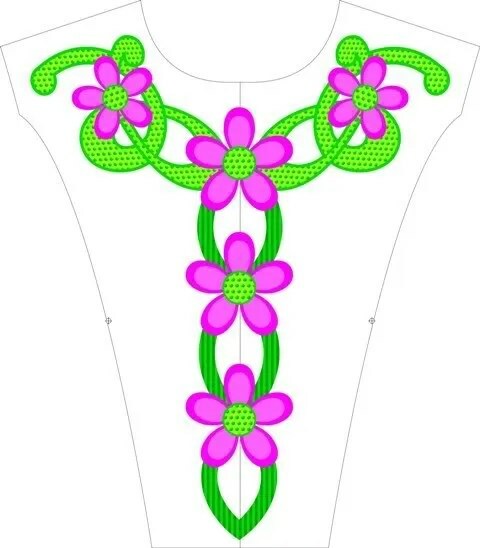 This is a pic of the flower dress bodice in the software after I finished digitizing. I am not always diligent about using the correct colors of thread when I am digitizing…the blue here should be green…but I know what I want. If I were doing this for someone else, I would use all the correct colors. 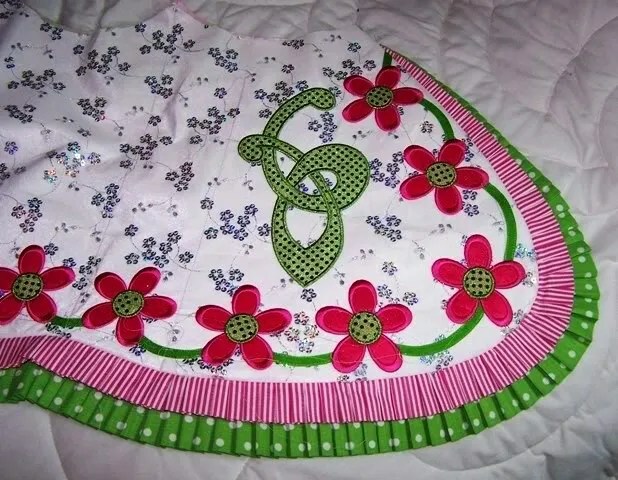 The single stitch curved lines down the center are placement lines for the green ribbons. I digitized the blue first because its ends must lie under the appliqued flowers. There is an underlay stitch under the blue satin stitching. 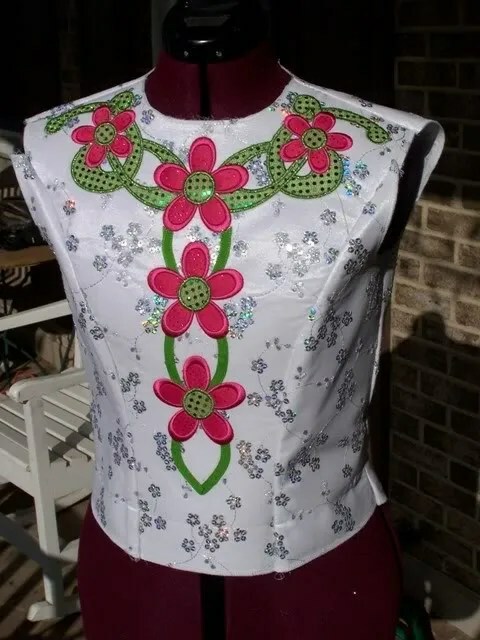 The appliqued flowers are digitized as follows: placement stitches for the applique fabric, tack-down stitch that runs after I have secured the cut applique pieces within the placement lines, then satin-stitches with underlay. 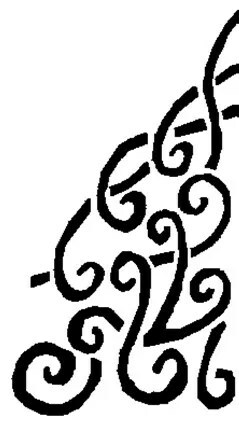 There are several ways to digitize the varying thicknesses of the satin stitch lines…I use whatever gives me the best look. In the center of the design, I have put in a single stitch cross of black (it was actually white and was removed when I was done embroidering). Since this design is too big for one hooping and I have to split it, I add this basting stitch to help me line up the designs when I re-hoop. Below is the first section I did. Below is the second. The top of the cross matches the cross above. This one took 5 hoopings. And I bent way too many pins rolling this mass up in a variety of ways so that it would not drag on the carriage. The embroidery software that I originally bought was the Bernina Designer Plus Version 4. Wilcom makes it. A friend who has commercial machines uses the commercial version of mine. I got a chance to see how he does things and he let me play with his software. Same capabilities but mine is WAY cheaper, tho’ still not cheap. I eventually bought bought the Version 5 upgrade. There are other software applications out there and I have explored several. All the others seem to come in pieces: you buy a platform and then add on only what you want. For craft folks who only want to stitch out designs they have bought, this is a cheaper alternative. But, by the time I would have purchased all I needed to do all that I want, I would have spent a lot on software that ultimately could not do what mine can. Funny that’s you’re on Zimmermaniacs; I haven’t joined yet, but I read it daily..
Girl…. just. WOW! Wow!!!!! I could never even fathom the amount of work that goes into your creations. Beautiful work! Enjoyed reading about you and your journey. Would love to know if Susan will make her swoop skirt alterations available to those who have purchased the pattern. Your rehooping is amazing…I’m still daunted by that!! Karma to you by the boatload. Ann…you amaze me!! I knew the work you did was far more than just putting a design in a computerised sewing machine. I don’t want to even begin to learn how to do this work, my little inbuilt stitches on my little sewing machine suit me just fine! Ann, you seriously amaze me. I’m also so totally embarassed at what I can offer to dressmakers compared to Susan–and how unclean of a copy I gave you. I’m better, now, but still nowhere near as neat as Susan’s. So. Jealous. And the flower dress is just so pretty. Oh Ali, I am so sorry that I wrote so clumsily! You have nothing to be embarrassed by! I loved that design then and I love it now. Because of your creativity and that design, I learned more than I ever would have had I started out small and simple. I thank you and think you are an incredible artist. Thank you! I have fixed this post to be more clear.